San Francisco’s Bayshore Boulevard was once waterfront property. There is no sight of the bay, or the shore from San Francisco’s Bayshore Boulevard. Since Islais Creek was filled in after the 1906 earthquake, the neighborhood filled in with carpet stores, lumber yards and industrial businesses. But once upon a time, the marshy land teemed with clams, crabs and fish. Though the topography changed, the restaurant taking its name from the local catch, is still here. 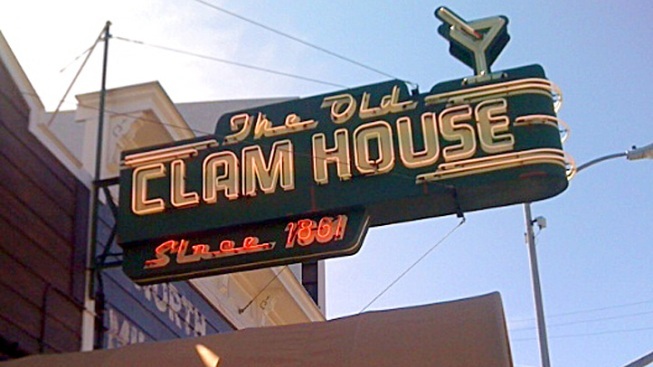 This week the Old Clam House will celebrate its 150th anniversary in the same location on Bayshore Boulevard. “The year this opened is the year Abraham Lincoln was being inaugurated,” said Clam House co-owner Jerry Dal Bozzo. The restaurant opened in 1861. It was originally called the Oakdale Bar but later became known as the Oakdale Bar and Clam House. Eventually it was just called the Old Clam House. This week the restraint is celebrating its 150th anniversary (the actual anniversary was in December). Far from Fisherman’s Wharf, it’s an old-timey holdout from San Francisco’s earliest days. The veteran restaurateur and his wife Jennifer remembered coming to the Old Clam House growing up. Last year they bought the business and went about stripping away decades of changes. One thing ousted was the hull of a Jaguar car mounted behind the bar. Barstools with metal tractor seats were replaced by cushioned bar seating. Longtime customers suspiciously regarded the intentions of the new owners. Instead of adding modern flourishes, the couple tried to restore the restaurant to the days when a gold miner might belly up to its bar for a steam beer. The menu still includes many of the restaurant’s original fare: Dungeness crab cioppino, oysters and clams on the half-shell. Customers still get a glass of hot clam juice to swill down alongside their bowls of steaming seafood stew.